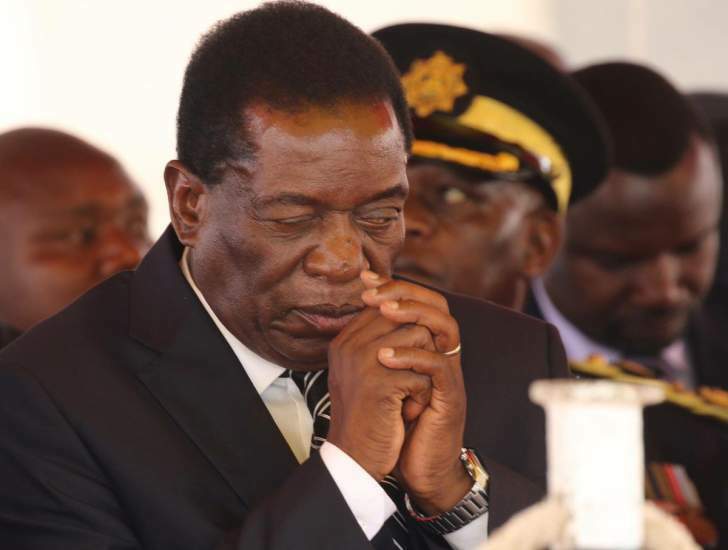 A daring plot to oust President Emmerson Mnangagwa through an impeachment process has been "foiled", according to one of the Zanu-PF leader's loyalists. The rebels "lack the numbers for impeachment", according to Justice Mayor Wadyajena, the MP for Gokwe-Nembudziya who had been approached to flip. Another supporter of the embattled 76-year-old leader, former Harare East MP Terence Mukupe, claimed that Mnangagwa had received "words of comfort and support" from "ZIPRA cadres" – thought to be a coded reference to Zimbabwe Defence Forces Commander Phillip Valerio Sibanda, who fought the liberation war on the side of the Zimbabwe People's Revolutionary Army (ZIPRA). Mnangagwa announced on Sunday that he was cutting short his five-country trip in Eastern Europe to return home, amid a swell of speculation that his deputy, Constantino Chiwenga, the general who led the November 2017 coup that ousted former President Robert Mugabe, had approved a plan to force him to resign under the threat of impeachment. The rebels, said to be supported by war veterans leader Chris Mutsvangwa and Zanu-PF heavyweights Obert Mpofu, Patrick Chinamasa and Oppah Muchinguri, who were all denied a seat on Mnangagwa's Cabinet, met with 35 MPs in Harare last Friday at which the plot was laid out. Wadyajena and Mukupe had also been invited, after the rebels calculated – it appears wrongly – that the two were sufficiently disillusioned after also failing to make Mnangagwa's Cabinet. The rebels accuse Mnangagwa of failing to unify the country by placing tribal clansmen in key government positions and also mishandling the economy, which led to countrywide riots on January 14 after he decreed a 150 percent rise in the price of fuel. The military and police have unleashed terror in response, leaving at least 12 people dead and 250 others maimed, according to human rights groups. It is not clear what a weekend canvass of Zanu-PF MPs by the rebels yielded, but both Wadyajena and Mukupe, who is not an MP but is seen as influential, revealed that they had been forced to abandon their homes after threats were made, apparently after they did not go along with the plan to recall Mnangagwa. Mukupe said in a January 19 tweet that he had fled to Mozambique, telling a ZimLive correspondent in a brief phone conversation: "Safety first." By Monday morning though, he said he was back in Harare, declaring: "I am in Harare. I will never sellout on my President, you are wasting your time threatening to kill me and my family. I will never join your sick plot! Come get me and do as you please but my President is not going anywhere! We are going to shame you devilish people!" And Wadyajena, in an early morning tweet on Monday, said: "They threatened to kill me and harm my family. I stand by @edmnangagwa and wish they knew ours isn't just a political relationship. However they try, we'll NEVER QUIT nor be intimidated. The plot is foiled, they lack numbers for impeachment and the devil isn't @ProfJNMoyo but amongst us!" A Zanu-PF official familiar with the plot, however, told ZimLive that the security nature of the threat to Mnangagwa's presidency meant that Wadyajena and Mukupe were not best positioned to judge its potency. "It is quite evident that the threat to Mnangagwa's presidency is, on the face of it, a political one, but the drivers in the background are security men in the military. The truth is that even if PV Sibanda aligns with Mnangagwa at this particular moment, the middle and lower ranks in the military are openly despondent with Mnangagwa's presidency and the threat won't go away," the official said. Mnangagwa, said the official speaking on condition he was not named, would also have to "go after the rebels", which could tear apart the party and leave him even more vulnerable. The country remained tense over the weekend as details of the plot emerged. The military remained deployed across the country, committing rights abuses, according to NGOs.